Last Sunday in our message “Faith Works” we examined the claims of Scripture that Christ is preparing a place for us – that heaven is real and that the glory of heaven will be being there face to face with the One who gave Himself for us. 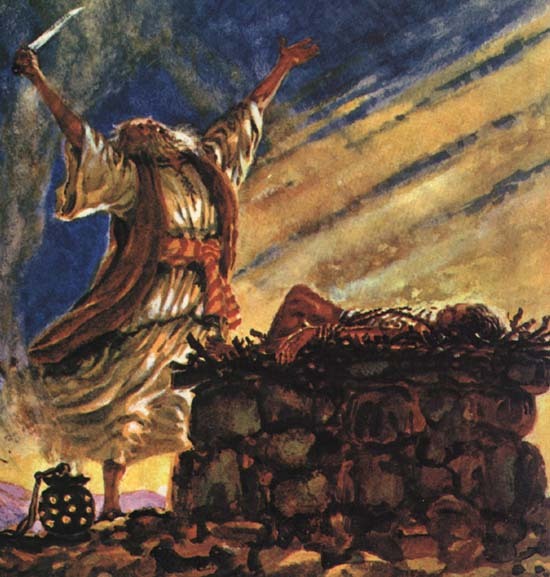 We mentioned briefly Abraham and his faith in offering Isaac up on the altar to God. What faith! He took the son he had been promised, the son of his old age, born in impossible circumstances, the son named “laughter” because both Abraham and Sarah laughed when God promised them the birth of a son in their old age, and he took him to offer him to God as a sacrifice. Abraham had such a faith in God that he obeyed without question when God commanded that he take Isaac and sacrifice him. Unquestioned obedience, even if it meant losing the fulfillment of a promise already given. How could Abraham take God at His Word to the point that he was willing to kill his own son – the fulfillment of God’s promise after a lifetime of waiting? Is this faith, or madness? It is true, as I was told often by my mentor, “There is a fine line between faith and foolishness.” How did Abraham discern the difference between the two? How did he know what to do and think all the while that he was in his right mind and not being led astray by some cruel hallucination or self-deception? This coming Sunday, February 20, in a message titled “A Family of Faith” we will study Hebrews 11:17-22 and see how Abraham, Issac, Jacob, and Joseph all had faith, generation after generation, trusting in God and obeying Him without holding anything back. Join us as we worship the true and living God and study His Word so that our faith and obedience might increase for His glory!